Many adults remember sitting in their desks at school, staring at the clock and counting the minutes until school was out, hoping the teacher would not call on them, and studying only the things they feared would be on the test. We tend to accept this experience as universal and inevitable, and yet the experience of boredom and frustration is utterly foreign to the Montessori student. This is just one of many answers to the question: "Why Montessori?" Traditional education, in its current form, has been passed on to us from its formation in the industrial age – and this is why the mentality of the assembly line still permeates most educational environments. Students are moved along from space to space while their heads are filled with knowledge by the workers, and bells ring just as in a factory to mark out the time. Occasionally, these students are examined to ensure that the workers are doing their jobs, and we expect a uniform product at the end. 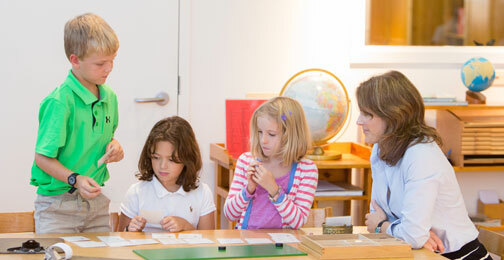 Montessori education, in contrast, sees the child not as an empty bucket waiting to be filled with knowledge, but as a unique human being in the process of self-formation, one who often has accurate instincts about what it is that he or she needs to do in order to grow and to learn. The products of such an education are far from uniform – high school teachers often comment on what unique and striking individuals our graduates are – and yet they are, to a person, excellent scholars who enter fulfilling careers. Forest Bluff students experience a daily joy in learning that they never outgrow. They undertake ambitious studies of their own initiative, show immense pride at the completion of a new task or project, and ask eagerly to be quizzed on what they have learned. This love of learning follows them throughout life, and leads them to educational paths and careers about which they feel truly passionate. Beyond the high academic standards for which Forest Bluff School is known, there is a focus in the classroom on the less quantifiable qualities of mind and spirit that traditional education has forgotten: responsibility, courtesy, peace, self-reflection, and kindness. Maria Montessori saw her educational method as a model for peace in society; and the skills of cooperation, leadership, and self-control that students develop in a Montessori environment are the ones that lead to a happy and fulfilling life. My family and I would like to thank you for all you do for our boys. Forest Bluff is a special place that provides so much value to our lives. Our boys enjoy attending your school and we enjoy seeing the progress they have made over the years. You have a difficult task in maintaining a school with today’s high pressure society and I appreciate your courage to stay true to the Montessori principles. I must admit–I was confused about the school at first, but seeing firsthand the sense of accomplishment in our boy’s eyes–I am a true believer! It’s about building their self-esteem through accomplishment and not about how the kids compare to the rest of the class. I feel like this simple concept gets lost many times in the fast paced world we live in. So: thank you for helping me understand this important fact of life.